The DREVO Gramr uses 84-Key layout to help gamers play with more freedom and comforts. It saves enormous space for mouse movement, thus attribute to aiming and spell using. There are four individual switches offered for different needs. All keys are illuminated with white LED and there are various lighting effects that users can choose for themselves. The braided sleeve promises the durability of the cable, moreover, it's more good-looking than plastic cable.
? 2. FN + 0()) = 6KRO? 3. FN + -(_) = 24KRO? Note: Press FN+2 firstly to turn on(indicator blinks)the recording mode, then you could adjust lights freely for your liking. Press FN+2 again once you have completed your ideal lights solution while the indicator will also turn off.? 6. FN + ¡û = Switch Between Lighting Effects? 7. FN + ¡ü/¡ý = Light Intensity Increment/Decrement? 8. FN + ¡ú = Turn On Breathing Effect? Arm Your Desk with DREVO: DREVO will constantly seek for the best solution to fulfill every user's requirement. Gaming Device: Real mechanical keyboard with 84 mechanical switches, responsive without the problem of sticky keys, double-shot keycaps with top-level material and prevent key legends from damage. Professional Performance: Standard equipment for pro gamers, truly improve gaming skills, N-key rollover helps you use spells faster and more accurate, keyboard shortcuts that allow you to choose the lighting effects and use media function, such as email, volume etc. White Backlighting: Clear and bright white backlighting with various lighting effects to bring more pleasure for playing at night. 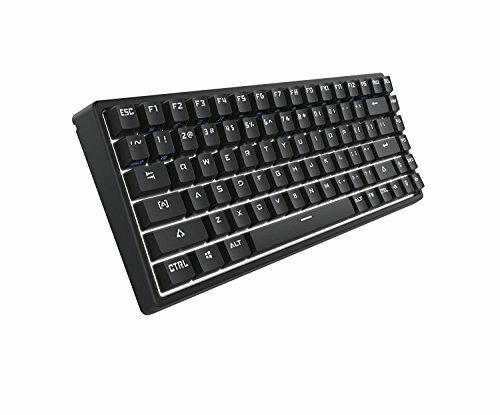 Attractive Features: 84-Key layout, four unique switches for choice, three back channels to solve the cord drag, top shell design that makes the keyboard more solid and improves the typing experience, FN + 0()) = 6KRO, FN + -(_) = 24KRO, FN + F12 = Lock Windows.